The practice of small animal orthopedics has advanced considerably in the 15 years since the publication of the first edition of Self-Assessment Color Review of Small Animal Orthopedics. Diagnostic procedures, instrumentation, implant systems, and surgical techniques have evolved and progressed considerably. This second edition of a trusted text keeps pace with the rapidly expanding practice of small animal orthopedics while embracing the developing fields of canine sports medicine and rehabilitative medicine. 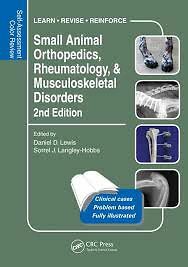 The newly titled Small Animal Orthopedics, Rheumatology and Musculoskeletal Disorders: Self-Assessment Color Review, 2nd Edition is designed to facilitate active learning through a new selection of clinical case scenarios along with integrated questions and answers that help readers develop sound decision-making skills. This illustrative, self-directed educational tool disseminates essential information to veterinary students, interns, and residents in training as well as small animal practitioners with specific interests in orthopedics, canine sports medicine, and rehabilitative medicine. In response to feedback provided by readers of the original text, references have been provided for each question, allowing readers the opportunity to delve more deeply into the topic of focus. The book includes contributions from an international group of clinicians and investigators. Orthopedic surgeons, radiologists, internists, pathologists, neurologists, and anesthetists as well as veterinarians engaged in rehabilitative medicine have provided their diverse expertise and experience to make this text a comprehensive review of the expanding fields relating to small animal orthopedics.